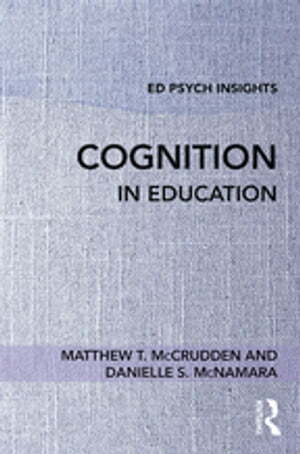 Collins Booksellers - Cognition in Education by Matthew T. McCrudden & Danielle S. McNamara, 9781315389042. Buy this book online. There is commonly-held belief that some people learn better than others because they are born that way. However, research indicates that many people who learn better are simply more strategic: they use effective strategies and techniques to improve their learning. Further, these strategies and techniques can be taught to students. Thus, understanding how we learn enriches our lives and the lives of others. Written by leading experts on learning, this book situates this topic within the broader context of educational psychology research and brings it to a wider audience. With chapters on how the mind works, evidence-based recommendations about how to enhance learning from both the perspective of students and teachers, and clear explanations of key learning concepts and ideas, this short volume is designed for?any?education course that includes learning in the curriculum. It is indispensable for pre- and in-service teachers and student researchers alike.